Did you know that watermelon can help you boost your brain power? 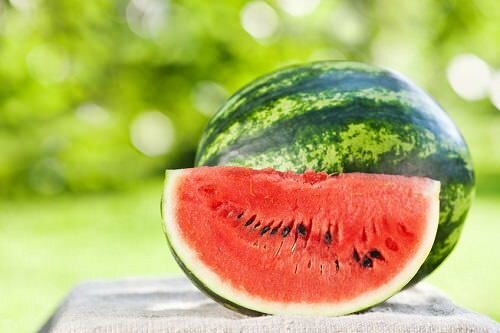 The thing is, watermelon is an excellent source of Vitamin B6, which is vital for normal brain function. Moreover, the water percentage in this delicious fruit is similar to the water percentage in the brain. Watermelon has an extremely high water content. According to the USDA, watermelon is 91.5 percent water, which means that this fruit can help you stay hydrated throughout the day. Eating watermelon or drinking watermelon juice each day is one of the most delicious ways to stay hydrated during this season, isn’t it? A cup of watermelon contains 1.5 times more lycopene than a large fresh tomato. Lycopene is a powerful antioxidant that helps prevent the free radicals from causing cell damage and can improve your immune system. Moreover, this powerful antioxidant has been shown to lower the risk of cancer in the body. Watermelon comes in different varieties. There’s a watermelon that is not pink on the inside. If you want to try something new, opt for Yellow Crimson. This yellow variety of watermelon has a sweet, honey-like taste that you’ll definitely love. But it can be difficult to buy a yellow watermelon since it’s almost identical with the other watermelon varieties. Watermelon is packed with Vitamin A, which is great for your eyes. It helps to boost your eyesight power and it protects your eyes from various infections. Consume about 100 grams of watermelon each day to keep your eyes healthy and your eyesight sharp. Numerous studies show that watermelon juice can help to reduce muscle soreness, so it’s a great drink after an extremely tiring workout. The thing is, watermelon is one of the highest sources of citrulline, which helps to improve artery function and reduce blood pressure. If you have a muscle soreness, consider drinking water juice. Though, I recommend you to consult your doctor first. Eating watermelon is a tasty and frugal way to cleanse your body and drop a few unwanted pounds. As I mentioned above, watermelon is low in calories and high in water and this helps with weight loss. Watermelon makes a great base for homemade smoothies and the perfect snack between meals as it provides the body with lots of minerals and water. Watermelon is high in lycopene, a carotenoid pigment that boasts powerful antioxidant properties. Lycopene helps to protect you against UV rays, sunburn and skin cancer. I think it’s an important reason to incorporate some watermelon into your daily diet. Watermelon is an awesome fruit that boasts plenty of incredible health benefits. Add watermelon to your summer salads and smoothies, grill it or eat it raw. Summer is the perfect time to enjoy this tasty and healthy fruit. What’s your favorite way to eat watermelon? Share your ideas with us, please.